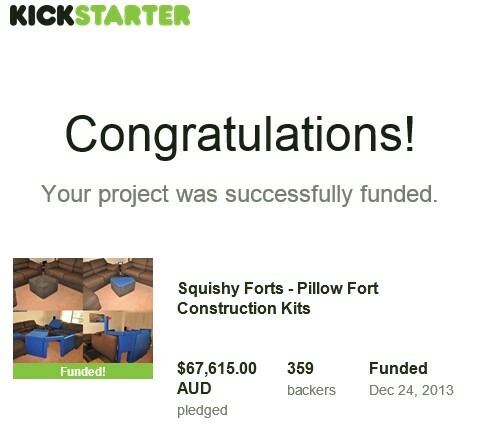 Squishy Forts Kickstarter Over – 270% Funded! Thank you everyone! With 270% of Squishy Fort’s original funding goal met, this is truly a great Christmas present that all of you have given me. It’s also my birthday on the 26th, so I’ll take it as a birthday present, too! I have to admit – things were looking pretty bleak at the start, and there was even a point where I told my girlfriend it was probably time to cancel the project. But, all the planning and strategising paid off, as Squishy Forts got picked up by media outlets like The Huffington Post, CNET and Gizmodo. We even made the front page of Reddit for a few hours! Your backing has not only provided the funds to make this happen, it’s also validated that Squishy Forts is something that people want to buy, rather than just a crazy idea I thought up. Running this Kickstarter project has been a really fun, intensive experience, but the real fun is about to begin! From here, it’s time to meet all of your rewards and build a sustainable business. This involves going through the manufacturing and shipping process, and building relationships with online retailers, as well as the old fashioned brick & mortar kind. As some of you would have seen in the Project Risks and Challenges, my background is in IT Security. So a lot of this is very new to me. But, my marketing plan worked out as expected, and I have full confidence that the rest of the plan will as well. I’ve got the next few months fully dedicated to this, and will keep everybody in the loop as I go. Now that Kickstarter is over, I’m going to take a few days to rest and relax, to spend time with my family over the holidays, and then I’ll be in touch with all of you to start sorting out colour preferences, shipping addresses, and all the other things that we need to do to get the rewards in your hands. Merry Christmas, Happy Holidays, and again a huge thanks to all my backers, and everyone who helped spread the word. Talk soon! 4 Days to Go – $50,000 makes us 200% Funded! For anyone that hasn’t been following the Kickstarter campaign, Squishy Forts has gotten a lot of media and Internet attention over the last week. As a result, we’ve been able to raise over $50,000, making the project more than 200% funded. This means that not only will Squishy Forts go into manufacturing at the start of 2014, but being overfunded also means that we’ve unlocked a number of stretch goals. First of all, we’ve added some new colours: pink and green (which we chose), and slate (which our backers chose). We’ve also added the couch set and the mega set. The couch set contains 10 x square pieces, and a couch-shaped cover; and the mega set contains one each of the Basic, Advanced and Couch sets. There’s only 4 more days to go with the project, but it looks like the funding is still coming in pretty hard and fast. 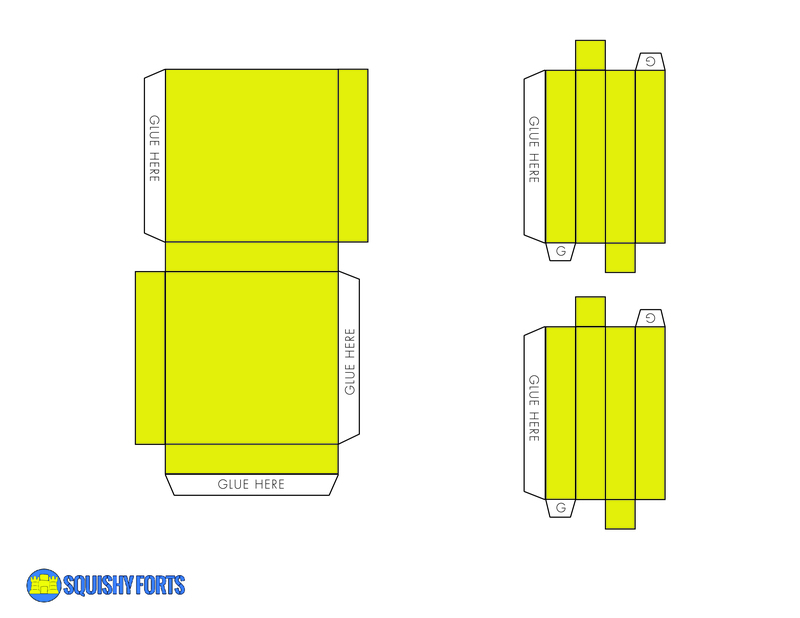 For anyone that hasn’t had a chance to yet, please jump over and check out our Squishy Forts Kickstarter page, where you can back this project and ensure you get one of the first Squishy Forts sets off the line. Our backers are currently voting in their favourite colour for our third stretch goal ($40k), but I thought I’d take a moment to share with you our Christmas Gift Pack. Now, Squishy Forts isn’t scheduled to ship until March, but I know a lot of you really want to give Squishy Forts as a Christmas Gift. This creates a bit of a problem, and I really want to help you out. Unfortunately, I can’t speed up manufacturing, but maybe I can do something else for you. A lot of other Kickstarter projects are giving little cards or graphics that you can print out, which say something along the lines of “your present is on its way”. But I wanted to do something a little bit more. So, I put on my thinking cap, and started talking to some of my friends and family. My brother and I came up with something that I think is pretty cool. That’s right. Instead of just giving you a card to print out, we’re giving you a paper art template which you can print out, cut out, glue together and use to build mini Squishy Fort constructions. If you really wanted to, you could probably even add your own magnets. I know it’s not nearly as cool as a real Squishy Forts set, but hopefully it’s a fun activity that people can do with their gift recipient, to help pass the time until your real squishy forts arrives. We’ve included templates in blue, yellow, red, green, brown, purple and pink. And here are the individual images if you want to print them separately. We’re getting a lot of traffic from a bunch of different sites today, so we thought we’d cover really briefly how you can go about getting your hands on Squishy Forts – the world’s first Pillow Fort Construction Kit. For those that aren’t familiar, Kickstarter provides an opportunity to inventors and other entrepreneurs to fund their ideas. 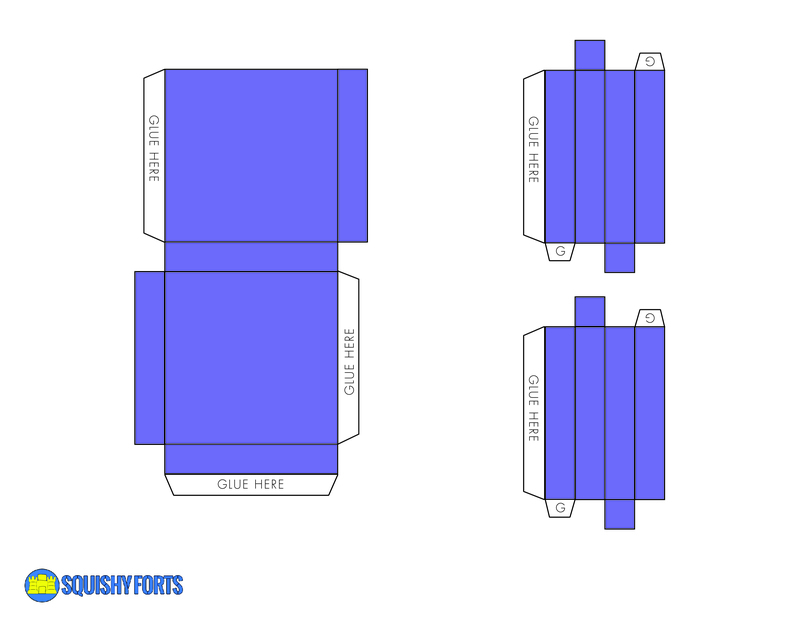 For Squishy Forts, we will be using your funding to take our prototype to manufacturing. 1) It’s not something you can buy today, but you can pledge to back our project and be one of the first to get a set when they’re released. 2) It means that if we don’t get 100% of our funding goals, Squishy Forts doesn’t happen. At this point we start manufacturing, and when your set is ready, we send it out! Squishy Forts in Different Colours! So, you want to know what Squishy Forts pillow forts will look like when we make them available in other colours? Well, we decided to show you! Currently, Squishy Forts is only available in Rearden Blue, Brick Red, Jet Black and Chocolate Brown. But we’ve thrown a couple other colours in as well. What colour do you want your fort to be? Funding continues to roll in since we pushed out the black Friday specials, and it looks like a few big websites are picking up the story of Squishy Forts! Today, we’ve made it onto the popular website, ThisIsWhyImBroke.com, which is pretty cool. When we came up with the idea for this product, it was one of our first goals to get it on ThisIsWhyImBroke – it seemed like the perfect website for us, so it’s pretty cool that this has happened. At Squishy Forts HQ, we celebrated by building a fort.